Curtis Engine is proud to be one of the pioneers in the development of Green Energy projects. Many years before the national outcry for renewable energy, we were part of a team that developed a landfill gas (LFG) electric power plant at the Brown Station Road landfill in Prince George’s County, Maryland. At the time such a project was truly “cutting edge” if not downright “experimental”. Over 30 years later, Curtis Engine is still operates and maintains the power plant. A lot has changed since 1987 and solar panels and wind power have become more popular forms of renewable or green energy. However, we still help landfill operators and wastewater treatment plants use their landfill and digester gases as an alternative fuel source. For these applications, biogas is an available, renewable, and eco-friendly energy source for powering onsite power generation systems that generate electricity for their facility. This helps owners and operators lower utility expenses, reduce their carbon footprint, and allow them to operate independently from the grid. Implementing a biogas-powered power plant using MTU Onsite Energy gas engines, landfills and wastewater treatment plants can reduce energy costs and gain a new revenue opportunity by selling power to the local utility. Along with generating electricity, landfill and wastewater plant operators can reduce carbon emissions, while also reducing odors and hazards. We can also integrate combined heat and power (CHP) equipment into the system to provide hot water and steam for buildings or industrial processes. If you are interested in exploring the use of biogas as an alternative fuel, contact us for more information. Many landfills already capture and burn landfill gas in a flare to reduce odor and prevent gas migration. Tapping into this gas collection system and using the gas to fuel generator sets, allows landfill operators to create a virtually free source of electricity, while reducing the odor nuisance and fire and explosion hazards. The electricity generated can be used onsite to power office buildings, equipment garages, or sold and exported into the utility grid. Sewage and water treatment plants remove physical, chemical and biological contaminants from wastewater. Due to the essential nature of these facilities, reliable power is a critical component to maintain 24/7 operations. While MTU Onsite Energy diesel systems provide backup and standby power 24/7, our CHP modules provide one of the most economical ways for sewage plants to utilize waste energy. 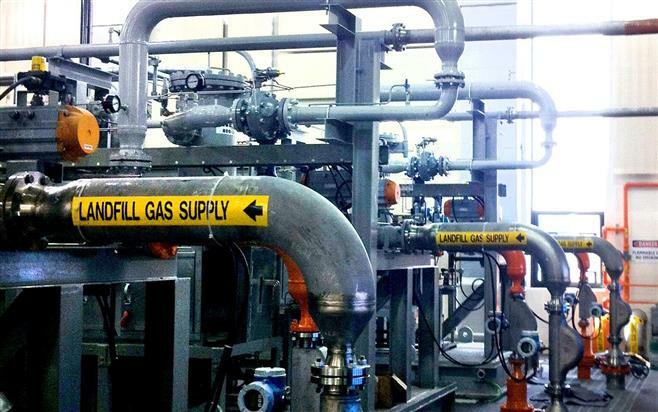 Sewage gas, much like landfill gas, is freely available fuel onsite and highly efficient. From about 6m³ of sewage, MTU Onsite Energy systems generate an average of 1 kWe of electric power and 1.2kWe of thermal energy. The electric power generated by the system can be used to supply the sewage plant itself or it can be fed into the electric grid. And the thermal heat generated inside the engine during the combustion process can be utilized for heating up the sewage sludge in the digester or for heating the whole facility. In large-scale plants, excessive high-temperature heat may be available that can be used to pasteurize or dry the sewage sludge.